Even with the New York Mets miles from contention, the injuries that have plagued them all season continue to pile up. On Thursday, Michael Conforto suffered a freak shoulder injury on a swing-and-miss. One day later, Yoenies Cespedes pulled up lame with a strained hamstring while running the bases. It’s likely that both players will miss the rest of the season, leaving the Mets short handed in the outfield and endlessly frustrated at the way their season has unfolded. Conforto’s injury was particularly troubling, as he dislocated his shoulder and tore his posterior shoulder capsule on a swing. The Mets have not said whether Conforto, who has been a rare bright spot for the team this year, will require surgery to treat the issue or not. If Conforto undergoes surgery, recovery could take up to six months. Of course, if he undergoes the surgery relatively soon, he should be ready for spring training. In any event, his season is likely over. The same could be true for Cespedes after another hamstring injury. Cespedes missed six weeks of action earlier this year because of a left hamstring strain. When he returned, Cespedes struggled to get going offensively, as the Mets fell out of contention. He only recently started to heat up offensively and perform like the player the Mets were hoping to have all season. This time around, Cespedes has strained his right hamstring. Mets GM Sandy Alderson said the injury is “similar in location and severity to the one on the left side.” Alderson adds that “his season is in jeopardy” considering how much time is left in the season. This year, the Mets have endured injuries to nearly all of the notable members of their pitching staff who were expected to make them World Series contenders this season. However, manager Terry Collins still expressed his disbelief at losing the team’s two most impactful position players on consecutive days. 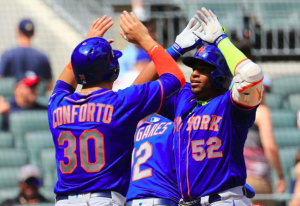 With the Mets having traded both Jay Bruce and Curtis Granderson earlier this month, they are quite thin in the outfield with Conforto and Cespedes likely out for the season. Juan Lagares and Brandon Nimmo both figure to play every day for the rest of the year. Both are trying to prove that they should be part of New York’s plans in the outfield next season. Meanwhile, the Mets have no other outfielders on their roster, at least until Cespedes goes on the DL Saturday and a replacement is called up. In terms of the playoff race, Conforto and Cespedes going down means nothing, as the Mets have long since been out of contention. In fact, evaluating players like Lagares and Nimmo may be more important than watching Conforto and Cespedes. However, the Mets losing Conforto and Cespedes to injury on consecutive days tells you everything you need to know about how their 2017 season has gone.